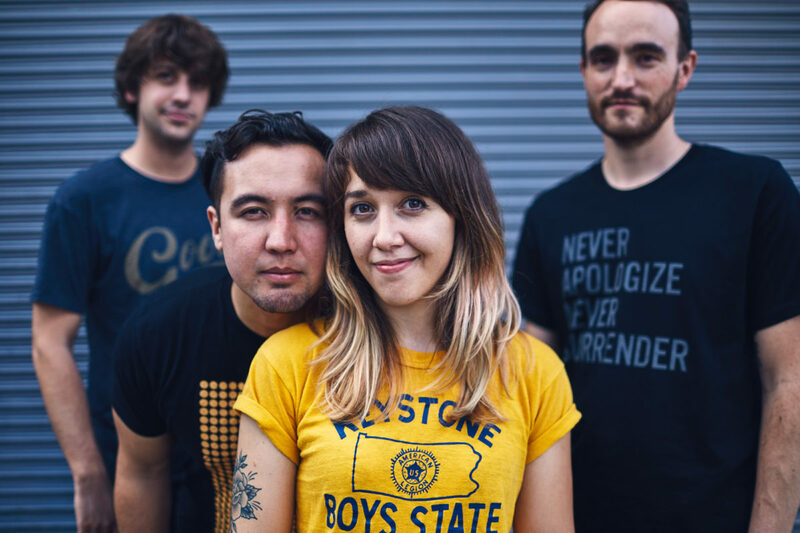 Meet fearless front-woman and lead singer/songwriter of Tiny Stills, Kailynn West. Most notable about West’s songwriting skills are the witty and often biting lyrics – a clever juxtaposition to the upbeat and playful power pop sound that the band’s music presents. Her music hits a sonic sweet spot that allows listeners to feel happy and sad all at the same time; a head-bopping, foot-tapping way to shake off bad vibes and start moving forward. Tiny Stills will be releasing their new album Laughing Into The Void on June 1st, and we’re counting down the hours, minutes, and seconds. Get know Ms. West in our exclusive interview below. She’s a bad babe! My sister gave me her old guitar as a Christmas gift and I took to it. I couldn’t play well when I first picked it up, so I tuned the strings till they sounded good together (DADF#AE) and started writing songs. I write down phrases or words I come across that make me feel something and I’ll come back to those phrases later. I’m an engineer as well as a musician and I record audiobooks when I’m not playing music so I am inspired by a lot of books I work on. A lot of times lyrics come when I’m driving or taking a run. I usually write lyrics first. It was born from a frustration of constantly feeling objectified and belittled because I am a woman- but somehow exploited whenever it benefited men. I was tired of seeing naked women on the cover of guitar magazines and simultaneously being told I have to play guitar like a man if I want to play well. I felt unwelcome in musical spaces. Even lifestyle magazines marketed toward women often encourage their readers to comment on each others bodies for sport. I gave myself permission to be angry about being reduced to a body and wrote a really angry and honest song out of it. People often underestimate the amount of musical knowledge that front women possess. What steps have you taken to overcome this barrier and what do you hope to see for women in music? I try to use whatever progress I’ve made to include women in music- I hire female photographers for shows, try to include female fronted bands or bands with women in them whenever I can when I am booking a show. The mastering engineer for our upcoming record “Laughing into the Void” is a woman- Jett Galindo. I try to empower and change the conversation by utilizing them and hiring them. They’re there. My hope is that it becomes less novelty to see women in all facets of the music industry. What do you want listeners to take away from your forthcoming album, Laughing Into The Void? You’re not alone. Being vulnerable is powerful. Be unapologetically you. I want listeners to feel celebrated and empowered. Who were your musical influences and how did they have an impact on your music today? Weezer, Piebald, That Dog, The Weakerthans. I like big powerful rock and catchy hooks and painfully real lyrics. Which leads me to the question – if you could cut a record with any artist, male or female, dead or alive, who would it be and why? I love multi-instrumentalist/producer Matt Mahaffey (Self). I’ve always admired his adaptable musicality, and I think his ability to play so many instruments really helps with songwriting as well. If you ever get a chance to watch his TEDx talk “nice guys don’t finish last nice guys finish happy” I highly recommend it for anyone who works in any creative field. I think it’s pretty clear that he just gets it. He would challenge me and push me out of my comfort zone for sure. What does the future have in store for Tiny Stills? I want to tour. I am happiest when I am out in the world and meeting new people. I discovered that in 2015 and have been ready to get back out ever since. And making another record of course. Don’t let the world convince you that you aren’t good enough. You have a story worthy of being heard. Support other women in your community and scene. Don’t work with people who don’t get it. Don’t accept toxic masculinity in your scene and around you. Find likeminded people and take over the world together. A woman who is unapologetically herself.